It could be devastating to your privacy to just throw away an old computer and hope that no one would try to access your information. Degaussing a hard drive and shredding one accomplish the goal of destroying information, but they do it in different ways. Everything you have ever done on your computer is accessible through your hard drive. That means emails you have sent, pictures you have saved, and accounts that you have signed into over the years. Although it doesn’t mean that someone will take your information, it’s better to be safe than sorry. Hard drive degaussing erases all of your information using a magnetic field but leaves small amounts of data behind. However, hard drive shredding completely destroys the drive and is considerably less expensive. When it comes to hard drive shredding, all of the information that is saved onto your hard drive is physically destroyed. 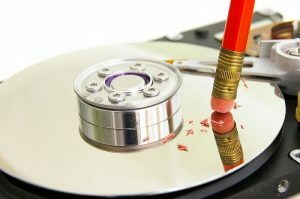 Your old hard drive will be torn apart completely, piece by piece, ensuring that nothing is still accessible. You should find a company to help you with your hard drive shredding to protect yourself from injury. Whether you choose hard drive degaussing or hard drive shredding, you are taking precautions to help secure your information and that is extremely important. You should look for the most cost-effective solution for your job. For free quotes on local hard drive shredding service providers, fill out the form on your right, or give us a call at (800) 747-3365 to get free hard drive destruction quotes from providers near your home or business.